But the adaptation of a Buckeye recipe to pretzel-stuffed-chocolate- covered-peanut-butter-balls could only have come from the crazy cravings of a pregnant woman. When my colleague Vanessa was pregnant with her son Ethan all she wanted was peanut butter, chocolate, salty and sweet. For her baby shower, I made these. Later when Vanessa's hairdresser was pregnant, she asked for the recipe and that is how they got the clever label of Preggers. I'm not the first person to make Buckeyes as shown by the fact that a google search will yield about 300,000 results. Traditionally these treats are made during fall football season to commemorate the The Ohio State Buckeyes. I know nothing about this - I don't follow football. I do follow peanut butter and chocolate though. The Buckeye recipe I used to create Pregger was actually a gift for my 21st birthday. The lovely husband and wife that I worked for at the now closed Cafe Piccolo in Burlington, Vermont gave me a book of their recipes including Buckeyes (and an infamous Peanut Butter Oatmeal Chocolate Chip Cookie recipe, which I will take to the grave with me). Hi Amy, Hi Dave, miss you guys! The thing I love about this recipe above all else is it's simplicity. No cream cheese, no cookie crumbs, no running to the store at the last minute. In fact, I bet you have all the ingredient in your kitchen already - so what are you waiting for - go make some! Combine the peanut butter, butter, salt and vanilla in a large bowl with a wooden spoon or spatula. Add the powdered sugar and mix until smooth, you may want to ditch the spoon now and use your clean hands for mixing from here on out. Add the pretzel piece until well combine. Line a baking sheet with parchment or waxed paper. 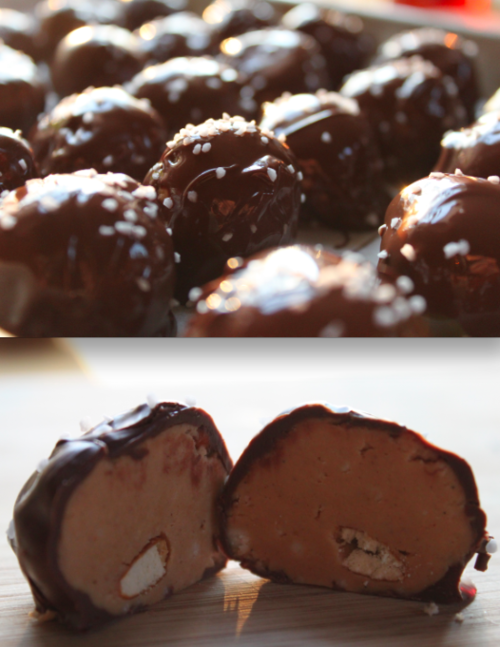 Portion the peanut butter mixture into 2 inch balls either using a spoon or small scoop and roll into balls. Refrigerate until ready to coat. Combine the chocolate and shortening in a large metal or glass bowl. Bring 1 inch of water to a simmer in a bowl that will comfortably accommodate your bowl ( you just built a double boiler, hey!). 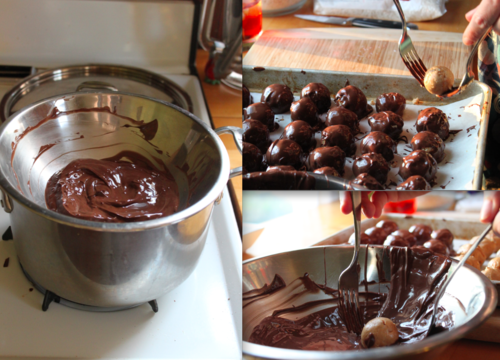 Set the bowl over the water and melt the chocolate, stirring occasionally, until smooth. Remove from the heat. 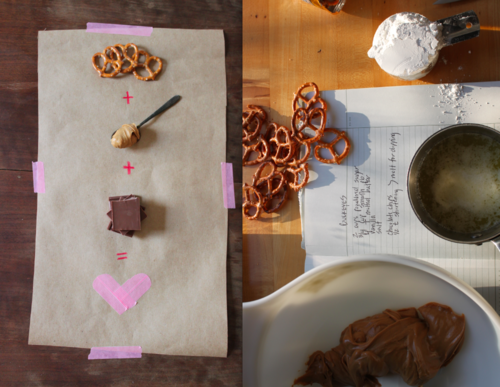 Dip the peanut butter ball in chocolate and return to the prepared baking sheet. Using a couple for forks as lifters will help keep your fingers clean and ensure a smooth coat. A sprinkle of pretzels or salt makes a tasty and pretty topping at this point too. I used pretzel salt, as I had some on hand and it seemed appropriate. Return the entire pan to the fridge until the chocolate is set, about 1 hour. Then these bad boys can be bagged and stored back in the fridge or freezer. * In theory the shortening in any chocolate coated candy recipe helps thin the chocolate for coating and give the coat a nice shine when it sets. But candy with this type of coating will never set hard unless it is chilled. This is mostly helpful to people who don't want to temper chocolate. However most semi-sweet chips are manufactured with such a high percentage of emulsifiers and cocoa butter that, if you use them to coat you won't really need the shortening or the tempering. And some people just don't keep the stuff in their pantry anymore. Work with what you've got, I say..